September 15, 2016, 11:08 AM · David Stern was just 16 when his father made his ground-breaking trip to China, documented in the Academy Award-winning film, From Mao to Mozart: Isaac Stern in China. That 1979 trip, made just as China was allowing Westerners visit the country again after a long period of isolation, had lasting significance for the community of musicians in China that had lived through the Cultural Revolution and were struggling to build their cultural institutions anew. Last month, David Stern was back in China, as he is fairly often these days. Stern is artistic advisor and principal conductor of the Shanghai Baroque Festival, and he also directs the Paris-based Opera Fuoco as well as the opera segment of the Crested Butte Music Festival in Colorado. On this China trip, he was serving as co-chairman of the jury for the new competition that bears his father's name, the Shanghai Isaac Stern International Violin Competition. One thing is sure: since the Sterns' first trip, Shanghai has grown immensely -- the city, and the music. While in Shanghai, David Stern sat down to talk with me about the Sterns' initial trip, about the explosion in Western classical music in China since that time, and about the new violin competition that bears his father's name. David Stern. Photo by Violinist.com. Isaac Stern's initial idea to go to China was born of pure curiosity. "For some reason China was always something that fired up the imagination of the entire family," David Stern said. "We read literature; we went to exhibits. There was something about China that somehow very benignly interested us." The invitation did not just fall out of the sky. "My father actually orchestrated the invitation," Stern said. "He wanted to come here -- he contacted [former US Secretary of State Henry] Kissinger so that he would be able to come here; that did not work. And then he heard that friends of ours, neighbors on the same elevator in the building in New York, were having the foreign minister of China over for dinner, and so he got himself invited to that dinner! Stern secured the invitation from the Chinese government, and then "my mother had the idea that this should be filmed," David Stern said. "I remember that first conversation at the dinner table about it; she was saying, 'It's going to be great!' and we were saying, 'Oh no, Dad, who wants to watch this? It will be so embarrassing!' We were talking about it as if someone was going to put a family movie onto the big screen!" The movie was produced by Walter Scheuer, a New York philanthropist with a commitment to the arts. "He went with the idea of making a movie, and after getting the money back just to pay the bills for what it cost, every cent of profit from this documentary went towards either Carnegie Hall or other musical projects," Stern said. The timing of the trip made the cultural interactions especially interesting. "This was the thawing time after the Cultural Revolution," Stern said, "so it was a perfect moment for that trip to happen." Stern said that his father did not have an agenda, say, to bring Western culture to the East. "It wasn't that it all," he said. "It was very much about trying to find out what's going on, what's making this country tick? Because post-Cultural Revolution, everyone was talking about China. Everyone wanted to know, what's going to happen in the future? We were still in the Cold War years, and China was suddenly this emerging power that was going to have a different perspective on things and alter the U.S.-Soviet balance. So there was a lot of talk about it. It wasn't just that we happened to want to spend a week somewhere." And yet all the Sterns were there: "My brother, my sister, my mother and I all went. I was 16, and my brother Michael was 19 and my sister Shira was 23. We went, not knowing what to expect," he said. "My father, obviously he wanted to connect, to continue his work with young people around the world. For someone who had no secondary, no primary education -- his mother took him out of school to practice -- he was homeschooled, never went to college. But he read so much. He picked up language, he gleaned. The interest with China was just more of his curiosity. So when we came here, it was as much listening to what was going on here as it was bringing his experience to the youth." When Isaac Stern listened to the young players in Shanghai, "there was an attempt on the part of the musical community here to put their best students forward and to show the mechanics of their playing, as much as possible," David Stern said. "The first thing he did was to tell them to start thinking beyond the mechanics and making music. There's the famous moment in the movie, where he has a young girl play something, and then he has her sing it. And then he has her play it again, and all of a sudden she's transformed. It's emblematic of the movie." The interest in Stern, and in the violin, was almost overwhelming. "To go into a master class situation where you have 2,000 people sitting there, riveted, clapping and laughing each time he would make a comment -- it was weird! But it was electric," Stern said. "You kind of felt like there was something that was going to happen." "It did, in so many ways," Stern said. China's interest in classical music has grown steadily in the last 40 years. "So much has happened since then: the number of musicians who are playing in China, the number of orchestras that exist, the halls that are being built, the festivals that are being created throughout China," he said. For example, the Shanghai Isaac Stern International Violin Competition took place in the Shanghai Symphony Hall, a brand-new facility with a chamber hall and concert hall that opened in 2014. Around the corner, as the competition went on, construction was under way on a new Shanghai Opera Hall. Shanghai Symphony Hall opened just two years ago, in Sept. 2014. "There are projects and investments in classical music going on today in China that are not happening anywhere else in the world," Stern said. "And it's not just money. Yes, there is a wealth that is going towards classical music, but there has to be a decision to make that wealth go towards classical music." While this year's Shanghai violin competition was funded primarily by the city of Shanghai, other cities around the world that traditionally funded classical music have cut back. For example, "the city of Paris has dropped all of its competitions for financial reasons, years ago," Stern said. "There used to be a Rostropovich Competition, there used to be a (Jean-Pierre) Rampal Competition -- these were all dropped. We're finding ourselves in the very funny position, in terms of world society and civilization, where we have to defend classical music as a necessary thing in Paris, and yet you go to a small town in China and they're building concert halls that are equivalent to some of the greatest halls in the world." Take, for example, the city of Tianjin, just south of Beijing in northeast China. Conducting in Tianjin a few years ago, Stern was able to see first-hand the $240 million arts complex the city had recently opened. 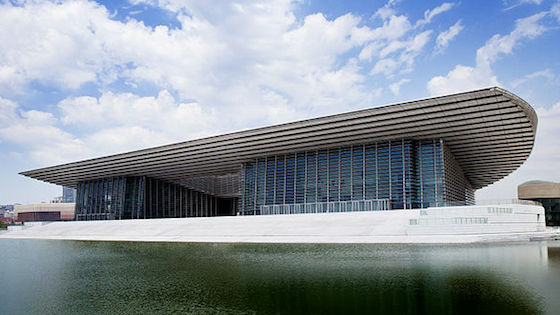 Tianjin's Grand Theatre performing arts complex. "They've built an entire complex that models itself after Lincoln Center -- the concert hall, opera house, library, gallery and museum. It's gorgeous, with the best infrastructure you possibly could imagine," Stern said. "It doesn't have the best orchestra there, but they're building the structure. This is completely public money, there is not an ounce of private money." Such arts complexes are going up across China. And the talent seems sure to follow; Tianjin also is the city where The Juilliard School is planning to build an extension, scheduled to open in 2019, in partnership with The Tianjin Conservatory. "The idea that Juilliard is finding in their interests to build a school in China means that it's no longer the paradigm of the Asian going to the West to study; soon there will be scholarships for people in New York to come study in China," Stern said. "What kind of shift is that? It's huge!" Stern, who has been conducting regularly in China since 1999, also sees a shift in musical leadership. While Chinese orchestra once looked to Americans or Europeans to fill leadership positions such as concertmaster, increasingly those positions are going to Chinese musicians who studied abroad and have brought their talents back home. Audiences seems to love the music, as well. When Stern conducts his annual Shanghai Baroque Festival in December, he finds that "the audiences are between 20 and 40 years old, and the concerts are filled," he said. "They listen, and they're really into it. There's always someone, somewhere in the front rows, who knows all of the text of Giulio Cesare or Dido and Aeneas. Something is happening in this country." A number of people present at the Shanghai Isaac Stern International Violin Competition last month were the very same people who had come to Isaac Stern's master classes during that famous first trip. Many of them are now teachers and professional musicians themselves and were now helping make the competition a reality, so "there's something very natural about doing it here." Yet the Stern family thought long and hard before agreeing to lend their father's name to the competition; it was the first international event to bear his name since his death in 2001. After the Shanghai Isaac Stern Competition: David, Shira and Michael Stern, with a picture of their father, violinist Isaac Stern. Photo by Violinist.com. What's more, "my father didn't like competitions. None of us in the family believes in the concept of competitions," David Stern said. "So why did we say yes? I did because my father helped young musicians in a very personal way, throughout his life. The music world has changed considerably since those days; it's much harder to give someone real opportunity to show him or herself." His idea was to fashion the competition in a way to bring attention to these young musicians -- public attention, and attention from qualified jury members. "I said to the kids at the beginning of the competition: don't think of this as who's going to win, think of this as an experience that will hopefully have a bearing on the way you think about music for the rest of your lives," he said. The requirements put the contestants through a range of experiences: fiery virtuoso works, musically-demanding Mozart sonata, playing chamber music; a Chinese piece that required attention to style, more sonatas, writing one's own cadenza for Mozart 3; a full concerto and virtuoso piece with orchestra. After each round, jury members met face-to-face with the competitors that did not go on, to discuss their scores and ways they felt they could improve. "There was one participant who said to me on the talk-back session that it felt more like a festival than a competition," Stern said. "I just wanted to hug the kid because that's exactly what I was looking for. I could not have put it better. If my father were watching -- and he probably is, he's definitely criticizing -- I think he would be pretty proud of that situation, that we were able to transform a competition into something that was festive, all-encompassing, and a real experience for all the participants." I saw 'From Mao to Mozart' years ago and was very moved by it. This interview is a follow up to it, but also a great eye opener about the future of classical music. Bravo! September 17, 2016 at 06:48 AM · I've seen more than once" Mao to Mozart" and always felt a special feeling of admiration for this documentary,thanks Laurie,. September 17, 2016 at 11:13 AM · What an inspiring article about China's growing Renaissance culture; such a contrast to the destruction and collapse of the culture in the United States. September 18, 2016 at 01:17 AM · Thanks for the article and all your writings on the Stern competition in China. I'be watched and loved From Mao to Mozart, and I'm happy to see that classical music is flourishing in China. I wish it were flourishing here. How strange that the US will send young musicians to study in China. David Stern is to be commended for carrying on his father's work.